On Thursday night in the Jerusalem residence of Israeli President Shimon Peres, American President Barack Obama received the Medal of Distinction, the highest honor that Israel’s government can award a civilian (and also a hunk of hardware that looks like it could be murder on the ole sciatica). As Rachel Maddow noted on Thursday night’s The Rachel Maddow Show, however, only some cable news viewers got to see that ceremony live: all of the cable news viewers who weren’t watching Fox News. One of the most important functions that a news program can perform, and perhaps the most basic, is to inform the viewer. While technically a so-called “opinion” program, this short segment of The Rachel Maddow show was packed with information. For example, I already knew that Republican deity and former President Ronald Reagan never visited Israel, nor did George H.W. Bush, and that George W. Bush didn’t make the trip until late in his second term. However, I did not know that the Medal of Distinction/Dothraki Battle Shield was the highest honor the Israeli government can give to a civilian, or that President Obama is the only U.S. President ever to receive it. Information. Viewers of the Maddow show who had missed news of the President’s trip would also have been informed of several events of the day, such as the heckler who interrupted President Obama’s speech to a group of students, or the weird robot snake he checked out, or clips from the speeches he gave that day. 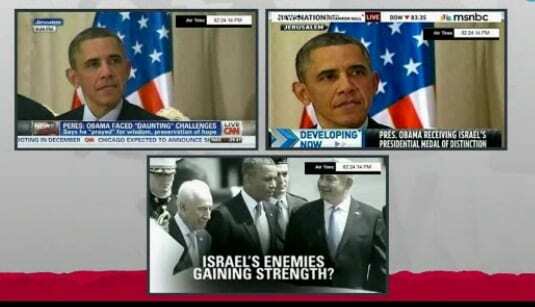 Fox was running a commercial about how Sean Hannity thinks President Obama is strengthening Israel’s enemies. When I saw the Maddow segment, I sus[ected there might be more to the commercial (sorry, Rachel), that there might be some part at the end that sort of redeemed it, like “But they gave him a medal! !” But I checked, that was the whole thing. I also checked the President’s schedule for Thursday, and as expected, the dinner and the award ceremony were covered by the White House traveling press pool. That means that whether or not Fox News aired the video of the first ever American president receiving Israel’s highest civilian honor, they paid for it. Much has been made, recently, of a Pew study that compared the ratio of “opinion” to “straight news” among the three major cable networks, but it didn’t really take into account the quality of the programming. Rachel Maddow’s show, while containing heavy doses of commentary, also fulfills journalism’s duty to inform. The study also made the assumption that “opinion” can’t also be news, an assumption belied by recent events (Robert Gibbs made news on several MSNBC opinion shows with a revelation about the drone program), and by one of the more pivotal moments in the 2012 presidential campaign. Mitt Romney adviser Eric Fehrnstrom made his now-infamous “Etch-a-Sketch” remark during an interview segment that Pew would have counted as “opinion.” The question was asked by comedian John Fugelsang. On the flip-side, your straight news is only as good as the news you’re reporting. If you can’t get your facts straight, or you select which stories not to air based on something other than established news practices, then it doesn’t really matter how straight it is. This entry was posted on March 22nd 2013 at 8:12pm/20:12 and is filed under Live News Column 1, Politics. You can follow any responses to this entry through the RSS 2.0 feed.